Its not even a month since we last wrote to you. But, we can’t hold back with an update when we have most of the things that you’ve asked for. 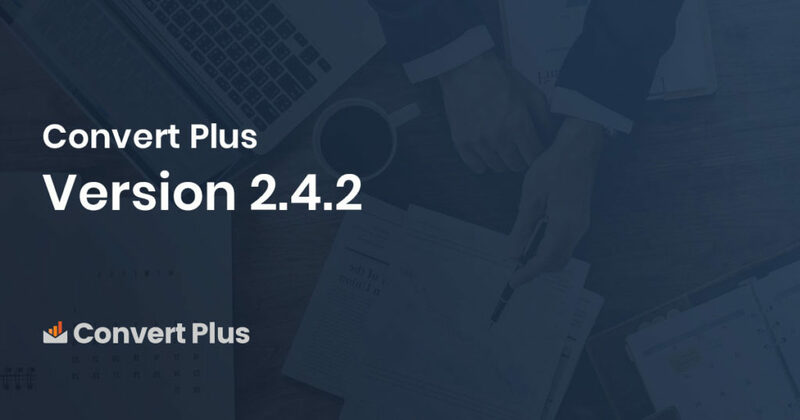 We are back here to present ConvertPlus version 2.4.2, with some new features, improvements you were waiting for and fixes for issues that you reported. This update mainly comprises of features like getting subscriber notification emails for all campaigns, customizing the subject and the body of the email, a new checkbox field added to the form builder and more. New: Added a typography option for close link tooltip of modal. New: Email notifications for all campaigns. New: Added checkbox field to form builder. New: Added option to set subject and message for subscriber email notification. New: Multiple email ID’s can be added to receive subscriber notifications. New: Hidden field that contain page_url name will generate current page URL. Fixed: Template import does not work due to server configuration blocking file_allow_url. Fixed: YouTube video not playing automatically if triggered with short-code. Fixed: Free ebook templates background color not applied issue. Fixed: Update contact if user is already subscribed for default campaign. Fixed: Disabled impression count setting not working for inline modal. Fixed: Option for Attached email field for layout 3 not working. Fixed: Form Layout not working in customizer. Although we’ve worked to make things work as expected, we would love to hear your feedback on this. Please update the plugin and let us know how you feel about it. In case you have some suggestions, ideas or simply need to discuss, you can post them on our Facebook Group or write to us too! Like always, we’ve made an effort to fulfill your requirements. We’ve done all that we could now, and promise to come back with some more. Theres always some more you can work on. We believe and implement it in our journey. Before we end up, do you remember our theme ASTRA – the fastest WordPress theme we had introduced earlier? Its live and available for download on the WordPress repository!